After more than five years in prison, former Illinois Governor Rod Blagojevich spoke to NBC 5 in his first television interview, revealing details of his life, his family and his hopes for freedom. Rod Blagojevich makes no bones about it. He’s doing a great job in his current position. Phil Rogers reports. Rod Blagojevich makes no bones about it. He’s doing a great job in his current position. Now in his sixth year at the federal penitentiary in suburban Denver known as FCI Englewood, the former two-term Illinois governor still adamantly maintains his innocence. And says he has managed not to become bitter about his plight. It is Blagojevich’s first public comment since he entered FCI Englewood five and a half years ago. Over the course of two one-hour conversations with NBC 5, the former governor spoke of his family and his desire to set the record straight through another appeal to the United States Supreme Court. Blagojevich is now housed in the “camp” at the Colorado prison, a lower-security facility where he enjoys more freedom. But he still faces the balance of a 14-year sentence and a scheduled release date in 2024. Blagojevich is correct. And he drew that 14-year sentence in a case where the government was never able to prove that he took any money. Still, his case achieved worldwide notoriety, branding Blagojevich as a virtual poster child for political corruption. And the U.S. Attorney’s office in Chicago is preparing to vigorously fight still another Blagojevich appeal. For Blagojevich, the world changed radically on the day he walked into FCI Englewood, March 15, 2012. At the other end of that tunnel, wife Patti has essentially become a single mother to the two Blagojevich daughters. Patti Blagojevich says she remembers vividly the day her husband was arrested in December of 2008. Blagojevich spent his first three months in the main institution at FCI Englewood like any other inmate---in the kitchen. But he quickly took on other responsibilities, in the classroom. To Illinoisans who were familiar with the sight of Blagojevich jogging through Ravenswood with his bodyguards in tow, it should not be a surprise that he continues to run on the prison track. He spends time in the weight room. And, he catches up on his reading. “Way more than I ever hoped for,” he notes. The former governor’s 14-year sentence came as the result of two criminal trials, two appeals, and one abortive trip to the Supreme Court. Out of all of those, he did manage to get five counts dropped from his convictions. But his sentence was not shortened. And now he is preparing a second trip to the nation’s highest court, insisting that everyone up to this point has gotten it wrong. Now, Blagojevich is once again hoping that the Supreme Court will listen as he essentially asks them to use his case to clarify when a politician steps over the line in fundraising. Because, he insists, he always stayed on the right side of that line. And those who prosecuted his case got it wrong. The result, after two criminal trials, was a sentence which is one of the longest ever levied against a politician in America. Blagojevich and his legal team point to other notable cases where there were much smaller penalties: former governor George Ryan did only 6 and a half years; many other governors in other states who were convicted of taking money or accepting lucrative favors have done fewer than two years in prison. Former House Speaker Dennis Hastert, whose life collapsed in a child abuse scandal, spent only 13 months behind bars. Jesse Jackson Jr., the former congressman, admitted looting his campaign fund of $750,000, but only drew a 30-month sentence. Evidence in the Blagojevich trial showed he never received a penny in bribes. But he is doing 14 years in prison. 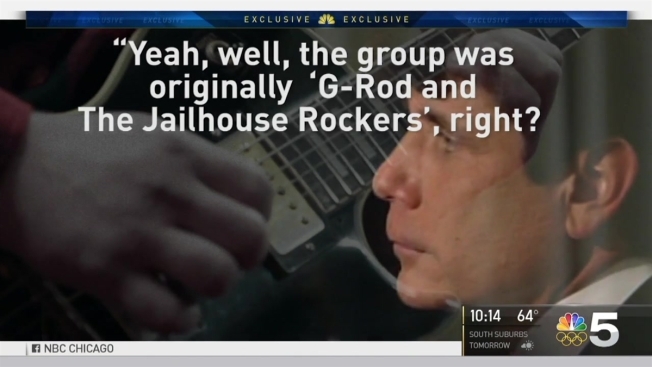 Blagojevich says he gets on well with his fellow inmates. Indeed, on that day he arrived, they knew he was coming, because they watched it live on TV. At his resentencing last year, many inmates wrote letters on Blagojevich’s behalf. He says he has tried to help many of them to prepare for life on the outside. “Especially in the higher security prison next door…you’ve got a lot of kind of a tougher crowd over there,” he says. “I spent a lot of time with several of them, walking around the track and actually doing some mock job interviews, helping them try to make their case to a prospective employer that they should not be prejudiced against them because they’ve been incarcerated. And then there was the band. His group performed for a GED graduation in June of 2013. For now, Blagojevich waits. He sees his family, on average, three times a year. And insists he is optimistic about the future. The Blagojevich legal case. And why he maintains, the courts got it wrong.